It was Christmas Eve and the terminal at Chicago’s O’Hare International Airport was a hive of activity as hundreds of holiday travelers were stranded and at the mercy of Mother Nature. The blizzard had begun to rage around noon and now, in the half-light of the late December afternoon it seemed, if anything, even stronger. A fierce, icy wind blew the snow before it, obliterating almost everything from sight. Vin jumped up from his seat and paced to the window to stare out at the blowing and drifting snow. From his vantage point above the runway, he could see that the airport personnel were fighting a losing battle. Their snowplows just couldn’t keep up with the onslaught of snow that was falling from the ever-darkening sky. Their flight back to Denver was going to be grounded for some time yet. This was not how he had planned on spending his Christmas Eve. Since Christmas fell on a Thursday this year, Judge Travis had given them a four-day weekend and the seven had made plans to celebrate the holiday at Larabee’s ranch, just as they had done every year since the team had formed. Leave it to the Federal Government to throw a kink into their plans. When he had arrived at work on Monday, Vin found that he and Ezra were ‘requested’ to attend a series of training seminars in Chicago. The flu bug was hitting that city at an alarming rate and, as luck would have it, two of the instructors that had come down with it were experts in their fields of undercover and tactical weapons training. Under the circumstances, there was nothing Judge Travis could do but accept the ‘requests’…. and so here they were….snowbound in a strange city on Christmas Eve with no way of getting home. When they had arrived at the airport to find that their flight was delayed, the undercover man had used every trick in his arsenal to obtain a vehicle for them. 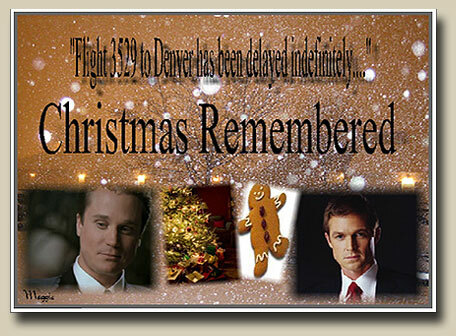 It would have been a long drive, but they still would have been able to make it home by Christmas day. Unfortunately a lot of other people had the same idea and there was not one rental car available in the entire city. So now all they could do was wait and hope that the weather would clear. As Vin returned to his chair, he rolled his eyes at his friend. He was mystified as to how the southerner could be completely unaware of the chaos going on around him. Ezra was totally immersed in a leather-bound book and looked as comfortable as if he were sitting at home before a roaring fire. The only thing missing was a glass of sherry in his hand. For the tenth time in two minutes, Vin started to rise from his seat when he felt Ezra lightly grab his arm. Ezra contemplated his answer. “Of course I am anxious to get home, Vin, however, as the situation is out of my control, I see no point in becoming agitated about it.” He stared pointedly at his companion. “Other than the last three?” The words escaped Ezra’s lips before he even realized what he said. He ducked his head hoping that in the noise of the surrounding crowd Vin wouldn’t have heard his comment. Unfortunately for him, the sharpshooter’s hearing was exceptional. The conversation continued on for several more minutes. Ezra laughed quietly to himself. Tanner was really in a talkative mood and he wished he could see Chris’ face on the other end of the line. Vin closed his phone with a sigh. Ezra stared at the sharpshooter in stunned disbelief. “You got yourself a deal there, pard,” Vin replied as he settled comfortably into his chair. This was going to be interesting. Vin could hear a note of sadness in Ezra’s voice. “Yes. Why is that so surprising?” Ezra asked. “I just thought that you would’ve called her Grandmother or somethin’ like that.” Vin was amazed that Ezra would use such an affectionate term as Nana; it had taken the other six men well over a year to get him to finally use their own first names. Vin leaned forward in his chair, fascinated. Ezra started to chuckle and Vin joined in. He was having a great time listening to his friend; the man knew how to weave a tale. Vin watched as Ezra reached up and touched his cheek as if recalling that exact moment. Having met Maude, Vin knew that she offered very little in the way of affection to her son, and he was glad to hear that there had been someone in Ezra’s life that had offered him the attention and love that he craved. Ezra paused in his reflections and Vin could see that his friend had been taken to another place and time. Shaking his head and chuckling softly to himself, Ezra pulled his thoughts back to the present, “It wasn’t so much that I was actually given a lot of presents that year, but just the fact that I was surrounded by so much….” He paused again, as if trying to find the right words. Flight 3529 to Denver is now boarding at gate 41….flight 3529 to Denver is now boarding at gate 41…. Ezra nodded, surprised to find that while he had been reminiscing the weather had cleared enough for their flight to depart. He quickly gathered his belongings and followed after his friend. Ezra knew of Vin’s aversion to confined spaces, so when the Texan had taken off on his second jaunt around the terminal to relieve some of his pent-up energy, he had risen gracefully from his chair and approached the ticket agent. With a twinkle of his green eyes and a flash of his dimpled smile, the weary clerk was more than happy to give him an upgrade to first class. So it was to Vin’s surprise that as soon as they boarded the plane, Ezra stopped in front of the first row of seats, indicating to Vin that he take the one next to the window. Vin looked at his friend in confusion. Vin smirked as he sat down. Not only had Standish gotten them better seats but he had also gotten them ones in the first row with the most of amount of leg room. They were going to have a very comfortable flight home. Contrary to Vin’s belief that he was unaware of the chaos going on around them during their long wait in the terminal, Ezra had observed quite a few things, including the effect that the Texan was having on the female population. He had noticed that a group of young women were watching his friend and then whispering and giggling behind their hands. As this same group of ladies boarded the plane right behind them, Ezra glanced at Vin out of the corner of his eye. Vin was settling into his seat and buckling his seat belt, totally oblivious to the glances that these same women were throwing his way. Ezra grinned as he, too, buckled his seatbelt. Tanner had no idea that his own ‘animal magnetism’ could rival Buck’s on any day. Once their flight had taken off and Vin’s white-knuckled grip on the arm of his seat had lessened, Ezra set out to put his friend at ease by continuing the conversation that they had been having earlier. As the two men settled more comfortably in their seats and accepted the drinks that the flight attendant was passing out, Vin’s thoughts went back in time. Ezra could hear a note of sadness in Vin’s voice. As Ezra listened to his friend reminisce, he realized just how very much they had in common. He knew what it was like to be shuttled from family to family and the holidays were always the worst, except when he was able to stay with Nana Caroline, but at least he knew that Maude would come to get him eventually. He couldn’t imagine what his friend’s childhood had been like knowing that he had no real family of his own. Vin startled to chuckle and Ezra joined in. He was having a great time listening to his friend; the man knew how to weave a tale. Vin paused in his reflections and Ezra could see that his friend had been taken to another place and time. Ezra laughed. He also enjoyed Ms. Nettie’s peach pies and he certainly wasn’t going to be the one to tell her. Heaven forbid if she ever quit making them! Vin continued, “That was the first and last Christmas that I spent with ‘em….stayed with ‘em a few more months and then they had themselves another baby and Mrs. Thatcher just couldn’t handle five kids so they moved me to another home. I guess the thing that made that Christmas so special was the feeling of….” He paused, as if trying to find the right words. “The Thatcher’s sound like wonderful people, Vin. Do you still keep in touch with them?” Ezra asked. Both men became quiet as they reflected on the people that had meant so much to them when they were younger. Before they realized it, the pilot’s voice came over the intercom. Ladies and gentlemen, we will be landing in approximately five minutes. Thank you for flying United Airlines and welcome to Denver. The flight crew wishes you all a very, merry Christmas. As the airplane finally taxied to the gate and stopped, the two men, by mutual and silent agreement, sat patiently in their seats as the rest of the passengers quickly retrieved their luggage from the overhead bins and from under their seats. They were more than willing to wait for the others to disembark. Due to strict airline regulations most families would be meeting their friends and relatives outside of the terminal or at baggage claim, but both Ezra and Vin knew that Chris would have pulled some strings and would be waiting for them as they exited the plane. Once the last passenger had disembarked, they grabbed their luggage and left the plane. As they walked side by side down the concourse and saw the other five members of their family waiting for them at the end, the two men reflected on the meaning of Christmas. It wasn’t about where you were; it was about who you were with. They glanced at each other and grinned. This Christmas Eve might not have gone as they had planned, but it was definitely right up there with the best. Authors Appreciate Feedback. Email Kate.